Mountain Dew has been a popular American soda for years. 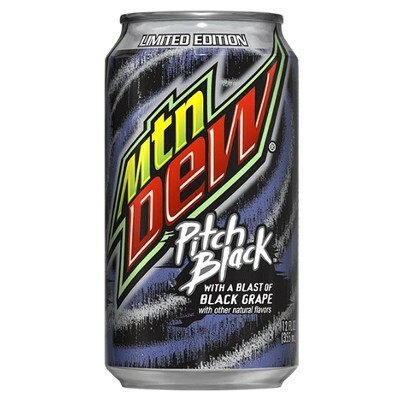 The Pitch Black Grape by Mountain Dew combines the great taste of a "dew" with dark fruit and a hint of citrus. It is both flavorful and refreshing. So, the next time you are craving a Mountain Dew, try a 6-pack of Pitch Black Grape for a bold new twist on an American favorite. Carbonated water, high fructose, corn syrup, acidity regulators E330-E331, natural flavor, preservative E211, caffeine, thickening agent E414, colors E129*-E133, antioxidant E385 (to protect flavor), emulsifier E444. Caffeine: 152mg/L. High caffeine content. *May have an adverse effect on activity and attention in children. Contains GMO. Nutrition facts (for 100ml): calories 48Kcal, total fat 0g (saturated fat 0g), total carbohydrate 12.7g (sugar 12.7g), protein 0g, salt 0g.